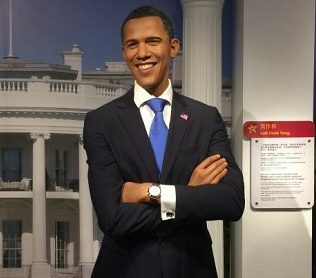 After researching the Internet for 2.5 hours, going to 15 different websites, we think we have found the best deal for Madame Tussauds tickets ($20 instead of $39). Klook is a reputable travel booking platform that offers hefty discounts on tickets. There’s a section for everyone. Are you a history or political buff? Then there’s the world leader section. Love sports? Snap a picture with five times Ballon d’Or winner, Cristiano Ronaldo. What is certain is you’ll leave Madame Tussauds with a whole load of beautiful photos with your idols. No one will be able to tell if it’s real or fake! Here are just some of the famous personalities! The boyishly handsome former England captain, David Beckham, is bound to leave soccer fans and the ladies swooning. 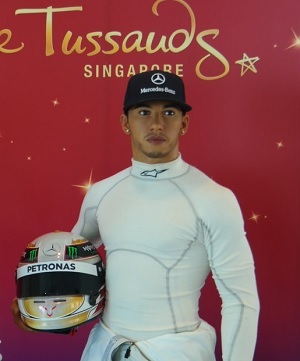 F1 superstar Lewis Hamilton looks fit in his racing gear, An apt addition considering Singapore hosts him at least once a year during its exhilarating F1 night race. 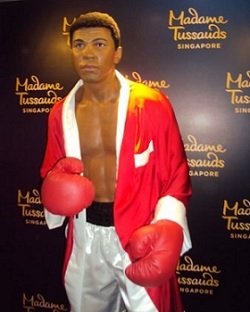 See boxing legend Muhammad Ali up close. Bonus points if you take a video of you saying his famous quote, “Float like a butterfly, Sting like a bee” to him. The man known as the King of Pop. Smash hits like Beat It, Billie Jean and Thriller will forever be classics. Pay tribute to the man who defined pop for decades by copying his famous dance moves! Since their formation in 2010, millions of girls around the world have fallen for them. It is pretty hard to snap a photo with this 5 famous boys. 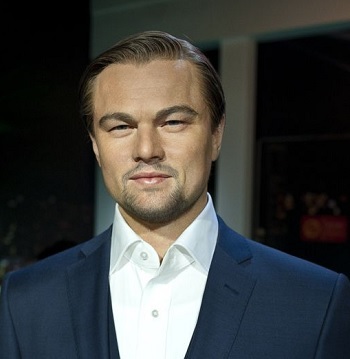 These realistic wax figures will satisfy even their craziest fangirl! If you are a Chinese speaker, you have definitely sung your hearts out to one of his songs during one of your karaoke sessions before. 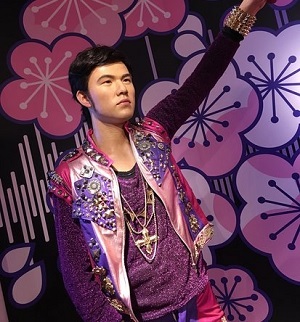 Jay Chou, the undisputed king of Mandopop, is here to take photos with you. Shame they didn’t record his voice, otherwise, we could have a singalong session right there. Since stealing our hearts in heart-wrenching Titanic, Leonardo DiCaprio has gone on to become one of Hollywood’s leading man. Join the queue to snap a photo or even give him a sneaky hug? For local drama fans, Zoe Tay is probably the biggest star that has burnt bright for the last 30 years. Snap a photo with a true living legend of Singapore’s media industry. The founding father of Singapore and a recognizable face anywhere in the world. 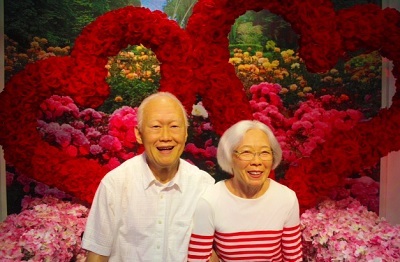 This is a beautiful recreation of the photo of Mr Lee Kuan Yew and his wife. Sit beside them and join them in the memory of their blissful life together. The first Black president of the United States of America who is respected as a politician all around the world. Also, the winner of the Nobel Peace Prize. 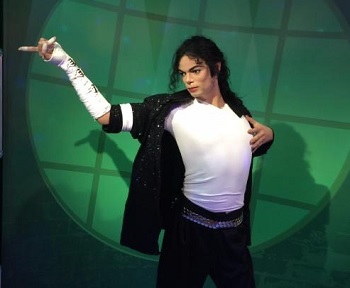 Even his wax figure exudes confidence and poise. Iron Man, Spiderman and Captain America. Besides all of them being Marvel Superheroes, what else do they have in common? 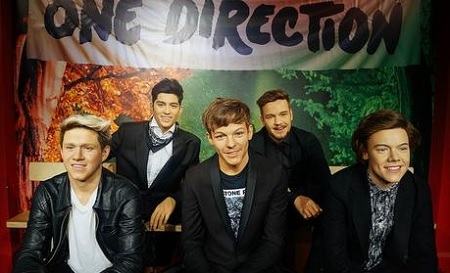 Well, they are right here in Singapore at Madame Tussauds! Ever wonder what it feels like trying on Iron Man’s suit of high tech armour? You can! Put on that stylish and sleek red armour plate with the glowing Arc Reactor in the centre. For a few minutes, you can step into the shoes of the flamboyant billionaire, Tony Stark. Take plenty of photos with the upside down Spiderman or the patriotic Captain America. As with all wax figures in Madame Tussauds, the attention to detail is impressive. For fangirls, Chris Evans handsome all-American looks are captured perfectly. Next comes the highlight of this attraction, the 4D cinematic experience. Put on that pair of 3D glasses and be immersed in the Marvel Comics Universe. The all-action packed scenes characteristic of Marvel productions are amped up with a four-dimensional attack on your senses. What’s cool about the short movie is the use of Singapore landmarks like the Gardens by the Bay and Marina Bay Sands. The local adaptation brings the action closer to home and makes it more enjoyable. 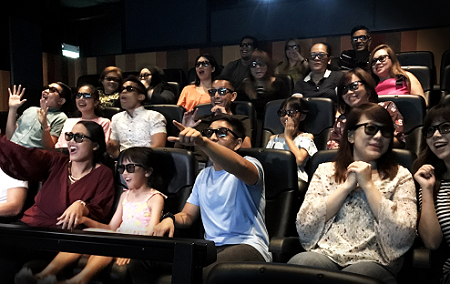 If you are a Marvel fan, you cannot miss out on this super cool 4D experience of your favourite superheroes. Go on a four-minute boat ride that showcases every national icon of Singapore. The glowing reputation of Singapore as a garden city is brought forth by the soothing scent of flowers like lilies and jasmine. The awe-inspiring Gardens by the Bay is brought to life in a miniature but still majestic looking recreation. Close to it is the Marina Bay Sands, a defining skyscraper in the Singapore skyline. Hear the rumble and screeching of tyres as the world’s first Formula first night race is held in Singapore. Just a few moments later, you’ll see the Singapore Airlines A380 jumbo jet right above you soaring into the fly. The entire boat ride is visually pleasing and engaging. The movement of the boat is smooth and gentle so you can take in the sights comfortably. A wonderfully enjoyable look into the pride of Singapore. Go through a vivid depiction of Singapore’s history of the last 200 years and truly experience the immense growth of Singapore over the years. The period of the historical show is set from the founding of Singapore by Sir Stamford Raffles in 1819 to the modern city-state of 2015. 15 scenes help move you along from one distinctive era to another. Live actors will portray characters that are representative of each era. Their interactions with each other and the audience are natural and pull you into the story’s narrative. One eye-opening scene was set in the 1942 to 1945 Japanese occupation of Singapore. While we have learnt of that experience through books and school, the idea of war seems foreign and far-fetched to us. Going through a simulated air raid and jungle escape set in that period will allow you to have a deeper understanding of how harsh it really was. Just experiencing these two scenes make going to the Images of Singapore worth it. Throughout the entire session, you will see Singapore’s rise from a fishing village into the economic miracle it represents today. Whether you are a local resident or a tourist, this unique Singapore tour is worth your time for sure. On the official Madame Tussauds website, there are a couple of ticketing options. For local Singaporean residents, you can expect to pay $28 if you book your tickets online. Compared to buying it at the counter, you’ll save $14! If you are a tourist, expect to pay $32 compared to the usual price of $42. These two prices include all 4 of the activities and attractions we have described above. BUT we have found you an even better deal so that you can save even more! How about paying just $23.50 instead of $28 or $32. Think its too good to be true? We were shocked at the low prices initially. We did a little research into Klook, the ticketing agent. What we found were thousands of positive reviews left by satisfied customers. Check out the reviews yourselves here! They also have an option without the Marvel 4D experience which costs just $20. Perfect if you don’t like 3D experiences. 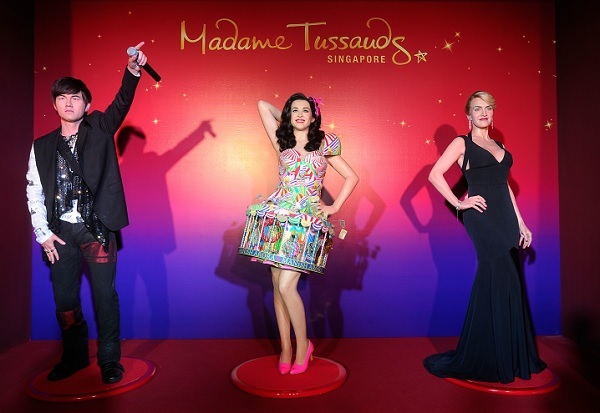 If you’re going to Madame Tussauds Singapore, definitely get your tickets from Klook! Located at 40 Imbiah Road, Imbiah Lookout, Sentosa, Singapore 099700. There are a total of 5 convenient ways to get there. If you are driving in, enter into Sentosa by the Sentosa Gateway and head to the Imbiah Lookout parking space. Once there, Madame Tussauds is just a minute walk away. Alternatively, if you are taking a taxi, head to Imbiah Road and stop at the Tiger Sky Tower. From there, it’s only a 100-metre walk to the museum. The Sentosa Express is a cheap and fast option. 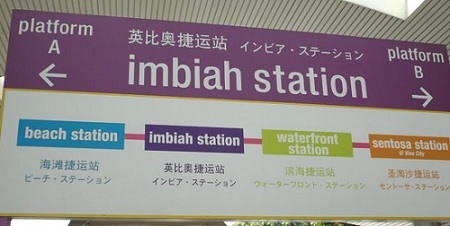 Conveniently located at Level 3 of the Vivocity shopping mall, you can hop on a mini train and stop at the Imbiah Station. Walk to the Merlion Plaza, hop on the escalators and you’ll be welcomed by the red carpet. A fun option to head in would be by cable car! From Harbourfront MRT Station, follow the signs which will lead you to Harbourfront Tower II, the start point of the cable car service. Feel like stretching out your legs? You can enter the island by the Sentosa Boardwalk. The walk-in will take about half an hour, but you’ll be rewarded by sea views and beautiful architecture along the way! From Monday to Friday, the attraction is opened from 10am all the way to 7.30pm. The last admission into Madame Tussauds is at 6pm to ensure you have sufficient time to enjoy the experience. For Saturdays, Sundays and public holidays, it is opened from 10am all the way to 9pm. If you want to squeeze in a late visit, take note that the final admission is at 7.30pm. 4 attractions for the price of 1 is super value for money. Additionally, all the activities are very interactive and engaging. 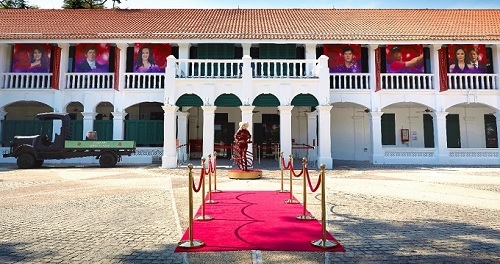 It is no wonder Madame Tussauds is one of the top attraction on Sentosa Island!